TORONTO (AP) Kyrie Irving returned from injury, but it didn’t do much to help the Boston Celtics. Kyle Lowry scored 23 points, C.J. 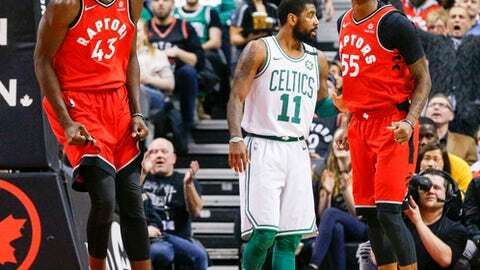 Miles had 20 and the Toronto Raptors routed the Celtics 111-91 on Tuesday night, snapping Boston’s four-game winning streak. Reserve forward Marcus Morris also returned for Boston after sitting out two games because of a bruised left hip but the Celtics suffered their second-worst defeat of the season. Boston’s only bigger loss was a 23-point defeat at Chicago on Dec. 11. Boston’s Al Horford shot 1 for 5 and finished with two points in 24 minutes. ”I just liked the way we came out and set tone on both ends of the court,” Raptors coach Dwane Casey said. All six of Lowry’s field goals were 3-pointers. His career-high is eight, set against Charlotte on Nov. 29. ”He got going and he cooked us,” Stevens said. Lowry and Miles combined for 11 of Toronto’s 17 3-pointers. Lowry made his first three 3-point attempts but no other Raptor connected from long range in the first quarter. Toronto led 22-18 after one. Toronto’s bench extended the lead in the second. VanVleet scored 10 points and Wright had nine as the Raptors connected on 13 of 19 field goal attempts in the quarter to take a 58-37 lead at halftime. ”We have literally two different teams and that’s a great thing to have,” Lowry said. Celtics: Irving missed the only previous meeting between the teams this season, a 95-94 Boston win on Nov. 12, because of a minor facial fracture suffered in a collision with teammate Aron Baynes. … Boston shot just two free throws in the first half. Raptors: Toronto is 15-3 when VanVleet scores 10 or more. … The Raptors are 31-9 when they record 20 or more assists. Irving said the Celtics should remember how it felt to suffer a heavy defeat to their division rivals, who they’ll face twice more in the regular season. Before the game, Stevens praised Toronto’s productive second unit. ”There’s not many groups I enjoy watching more,” he said. ”Probably not a lot,” Wright replied.